An child orphan who joins Hyakkimaru on his journey. Dororo was the only child to the leaders of a band of thieves (who stole from the rich and gave to the poor) who were wiped out. Spunky and ready to fight, Dororo takes punches alongside Hyakkimaru and has an extreme soft spot for other young orphans and small animals. 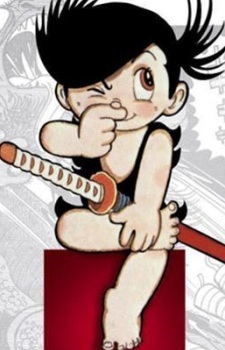 Dororo is female, she hides her gender in order to protect herself so that she won't being kidnapped and sold into prostitution, and in general to fend of potential attacks of sexual nature from people who try to take advantage of poor orphaned homeless girls. Hyakkimaru who has heightened supernatural senses knew Dororo was a girl from the first time they met but did not treat Dororo any differently nor did he bring it up. Only in the end did he reveal that he knew and gave his sword to Dororo so that she may grow up to be a strong beautiful woman. Hyakkimaru left vowing to meet Dororo again once after regained his whole body. It took 50 more years till the last demon was slain.